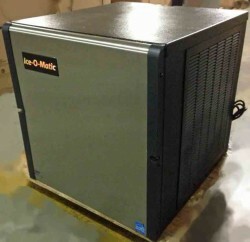 Ice-O-Matic is one of the major manufacturers of ice makers. The company has been designing and providing ice machines since 1952 and is always working towards better and more efficient products. Their models are long lasting and are produced with high quality materials that allows them to remain service free. The Ice-O-Matic model ICE0520A is one of their slim-line ice machines meant for locations with space restrictions. It is 22” wide instead of the normal 30” models. While small, this ice maker is still rated as one of the most efficient and top quality ice makers. The narrow profile of the ice maker allows it to be easily placed anywhere and still manages a high output of ice cubes rated at 520 lbs of ice per day. The exterior of the ICE0520A ice maker is contains a fingerprint proof material, which allows the ice maker to remain clean and the evaporator or ice mold of the ice machine is nickel plated, which helps enhance the life of the ice maker. Along with these features, this model of ice maker provides consistent ice cube production that are dropped into your storage bin or ice dispenser automatically and comes complete with an auto-shutoff when the bin becomes full.